Harriet Ellenberger (aka Desmoines) grew up in Des Moines, Iowa, pre-2nd -wave-feminism. By 1969, when she graduated with a degree in philosophy from the University of Iowa, she was an activist in the civil-rights, anti-war, and poor-people’s movements. She married her former history professor and moved with him and his sons aged 10, 11, and 12, to Charlotte, North Carolina, just before the women’s liberation movement exploded spectacularly into existence. She joined a consciousness-raising group and became a founding member of the Charlotte Women’s Center in 1971. Five years and a myriad of dramatic/traumatic changes later, she founded Sinister Wisdom with Catherine Nicholson, as “a journal of words and pictures for the lesbian imagination in all women.” They lived and breathed Sinister Wisdom until 1981, when they passed the journal on to Michelle Cliff and Adrienne Rich. After Catherine accepted a job at Goddard College, Harriet became her student in theatre. A risky choice for two formerly equal partners, this did, however, lead to interesting experiments with lesbian-feminist theatre and the publication of Harriet’s master’s thesis on lesbian theatre. 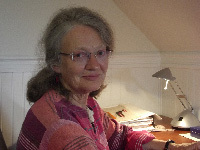 In 1987, Harriet left for Montreal, to organize for the Third International Feminist Bookfair and to become a founding partner in L’Essentielle, a bilingual feminist bookstore. Though the bookstore eventually failed, she stayed in Canada, learning French well enough to translate for a living, and meeting people from every corner of the world. She became a Canadian citizen in 1995. From 2000 to 2003, Harriet edited the small web publication She Is Still Burning, and from 2004 to 2008, she co-edited Trivia: Voices of Feminism.Since 2012, she has been a regular contributor to Return to Mago e-magazine. Harriet currently lives in rural New Brunswick, Canada, where she and her partner have been renovating an old farmhouse. Her newest motto is “Write poems until you drop.” The poems, along with selections from her prose writings since 1969, can be found on her website at https://harrietannellenberger.com.